Coal ash at the Dan River plant in Eden, NC. Back in February, a storm pipe ruptured underneath Duke Energy's Dan River Coal Plant in Eden, North Carolina. 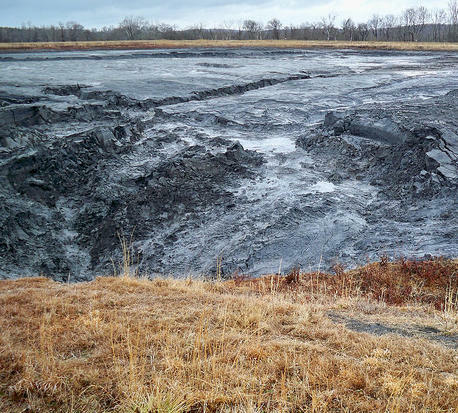 Within hours, 39,000 tons of coal ash spilled into the river. It was the third-largest such spill in U.S. history. In response, North Carolina passed the first-ever law to create rules for disposing of coal ash, a waste product of burning coal for power generation that can contain harmful levels of toxic chemicals. As part of the law, a commission was created that will make crucial - and expensive - decisions on what to do with the more than one hundred million tons of coal ash spread across 14 sites in the state. Herbert Eckerlin is one of the commission members. He has been an engineering professor at NC State for nearly five decades. In the early 1980s, he built the Solar House, which later became the NC State Solar Center. He was also a treasurer at the North Carolina Sustainable Energy Association. During the first Coal Ash Commission meeting last week, Professor Eckerlin asked a few questions, but mostly listened attentively to presentations on coal ash storage and disposal methods. After the meeting, he stood by his statements on global warming not being a “provable issue.” In a short interview, he was asked if his opinions on climate change and global warming were in line with the mainstream of other scientists. Eckerlin and his colleagues on the Coal Ash Management Commission will meet again in January and through the next year or so. The decisions they make could have a deep and wide-ranging impact - as they determine how 108 million tons of coal ash across the state will be classified, transported, and contained so that it won’t pollute our rivers and drinking water. >> Read more stories about the coal ash spill. The long road to determining how Duke Energy will clean up its 32 coal ash ponds starts today. The Coal Ash Management Commission holds it first meeting in Chapel Hill. Among the many decisions the Commission will make is classifying the ponds as low, intermediate, or high-risk. “The classification is really going to drive what the final closure plan looks like,” says Robin Smith, an environmental attorney and a former assistant secretary at the Department of Environment and Natural Resources. Following a massive coal ash spill into the Dan River in February, The Department of Health and Human Services issued an advisory downstream from the site, recommending people stay out of the water. Now, after surface water and soil testing, state health officials say recreational use of the Dan River is safe. It has now been almost six months since a Duke Energy storm water pipe ruptured near the Virginia border, sending 39,000 tons of potentially toxic material into the Dan River. Some of the effects have been marginal and others remain unknown.